Lisa P. Nathan: Well, thank you very much. My name is Lisa Nathan, I’m with the Information School at the University of Washington and I would like to begin by asking you to say your name, your home country and your role here, your job title. Thank you, Lisa. 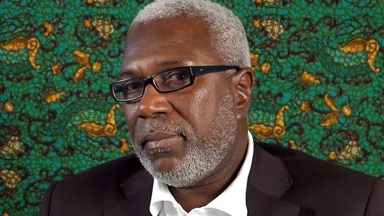 My name is Bocar Sy, I’m from Senegal originally, but I’m living in France for something like 40 years. I grew up there, I went to school, to university there and since something like now ten, maybe say more, 12 years here in the International Criminal Tribunal for Rwanda working for the United Nation system we can say. Yes and I’m the Chief of Press and Information or, if you want, the Chief of what is called communication cluster, dealing with information and public relations. LPN: Have you had other roles at the ICTR? Did you come here as Chief of Press or were there other things that you did? And what year did you start? I’m the one who set the Office of Information and relation with the public. When I was, when I joined the ICTR – it was in 1996, May 1996. It was just after the tribunal has been set here in Arusha. The judge were at that time, they were not based here, they were not here in a permanent basis. They was going and coming, they were just coming to sit whenever they have to hear a case like the initial appearance, when somebody is arrested or when they have to confirm an indictment or something like that. That is why they, they, they used to come at that time. But they were not here in a regular basis. We used to have one judge coming to confirm an indictment; another one can come a month later or something like that. At that time they were not – that is when I have been hired by the tribunal to set the office of the press and information. There was nothing here at that time, it was, it was not so easy, it was, it is not like this. Now that, you know, you can sit in an office like this and have an interview with these cameras and whatever – at that time that was not the case, because for the people to, to, to reach this place, like I suppose coming from Nairobi, which is just here where you have a, a large number of journalists based there. You know that Nairobi is a very important base for the journalists covering this area. It was really, really, really – I, I don’t know how to say exactly but it was really a problem for them. First of all the roads were not very good. The roads from here to Nairobi which is something like less than 300 kilometers but they have to travel the whole day. And they had to leave in the morning in Nairobi and can join this place at the end of the afternoon, beginning of the night. It was really, really a problem and there was no fixed road. Now that, if, if you, if you, if you go in town you will be so surprised. If – for someone who has been here like me for ten, 12 years, you will see they have – the roads are properly fixed. The lights are working properly, they have, they have traffic lights. At the time we cannot imagine that we will have one day a traffic light in this town that was big, I mean, holes on the – what we used to call craters on the roads you know, they, they were, they were. You cannot imagine how it was so difficult to move in this town. And that was really one, one of the things you know, which can surprise someone who has been here in 1996 and now you know, how things, things have been improved. That is, that is when I joined this place and everything has to be built. That was nothing and I was talking about Nairobi, but I can take the example of Dar es Salaam. At that time to join Dar es Salaam through the telephone lines you have to try maybe during one hour or more just to have the line connected. That was really a problem. That is why if you, if you look at the roof of this building you’ll have big satellite dishes. That is why the communication decided to put these satellite dishes to facilitate the communication, the telephone communication and also have these internet and website. At that time there was no website, there was no internet. The only way to communicate with people was to send them fax and fax was working with the telephones, or telephone, or make a phone call or drive your car to go, to join them, which was not so easy. Dar es Salaam is at something like more than 500 kilometers. You imagine to go there and the roads were not so good at that time. That was really a problem.